I am going to re-post the video you have brought over on the Richat thread. Thank you this guy makes some very interesting observation's. I'm not sure what this means or if it's consistent with a greenland impact. Is this the first or the second creator found there recently. I thought i just heard them say a second even larger one was just found. The USGS magnetic anomaly map shows a 64 mile diameter depression shaped like a crater in the center of Lake Michigan. Sheboygan is on the south west side. The trajectories of the Younger Dryas black mats, the Nebraska Bays and the Carolina Bays, corrected for the rotation of the Earth, intersect with this shape in Lake Michigan. Core samples taken by the Wisconsin ground water survey show what may be a complex crater near Sheboygan. Much of the Lake Michigan Triangle lies within this shape. Several III AB meteorites have been found in the area around this depression. 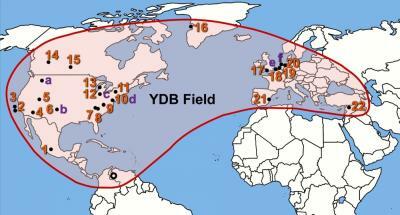 The Cape York meteorites in Greenland are class III AB. The Mary Bay hydrothermal explosion in Yellowstone Lake, which happened around the same time, is thought to have occurred when a tsunami in the lake reduced the pressure above Mary Bay allowing the explosion. Ice splashing into the lake would have caused a tsunami.